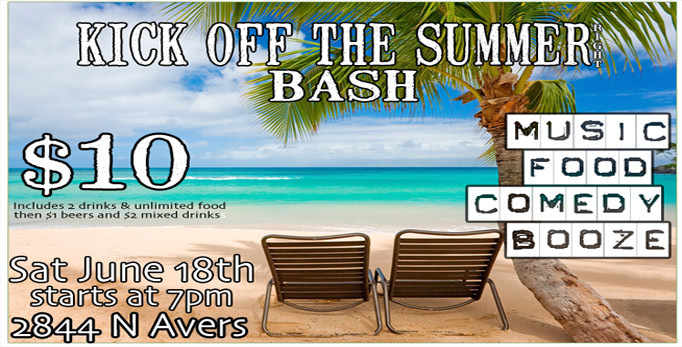 Event: WatchVeTv.com and Visual Edge Entertainment, Inc will host their “Second Annual Kick Off the Summer Right Bash” on Saturday, June 18th at 2844 N Avers. Doors will open at 7pm for food and drinks with the first act going up at 8pm. This is an 18 &amp; older event with a $10 donation requested for admittance that will help cover the associated costs of the event. This includes all the food and entertainment plus 2 free drinks. Drinks purchased will be $1 for beer and $2 for mixed drinks. The event will start off with comedian Sarra Jahedi at 8pm. Sherman Edwards, a Blackout Comedy member; will follow with his succinct anectodial humor. The headliner will be Kyle Ayers, a Second City alum originally from Missouri who is creating a buzz here in Chicago. Immediately following the comedy showcase will be Bring It On Home. Bring It On Home is a Led Zepellin cover band that was formed earlier this year. They will be performing many of Led Zepellin’s greatest hits and will capture the energy and power of them as well. The night will go out with DJ Mirrorcle who favors the genres Dance, Trance, Electro and Euro. DJ Mirrorcle is a determined, young dj with many mixes available for download online.